I'm back with the last sketch of the month for the Viva La Verve March challenge, hosted by my friend Andrea Ewen. Thank you, Andrea, for making this one SO easy! The turquoise paper is from DCWV's Garden Party stack, and I embossed it with my new Kassie's Brocade folder by Cuttlebug. LOve it! Also new to me is the Garden Trellis deep edge punch by Martha Stewart. I adore the simple fonts used in the Small Phrases Verve set. Because the K & Co. die cut sticker set (used on my Viva La Verve #3 card earlier today) was already out on my work area, I chose three small ones to accent the sentiment panel. I also used Petal Pink Liquid Pearls to spiff up the center of the rose. If you haven't played with us at The Play Date Cafe yet this week, you still have until midnight tomorrow (Tuesday, March 27th). Give those colors a try! Later this week, I can finally share some "happy news" with you that is under wraps right now. Can't wait to share!! Jusy lovely Colleen! The embossed background is GREAT!! Gorgeous card Colleen!! I love the colors - the pink on the aqua is just beautiful!! Isn't this so sweet - what a great thing for someone to get in the mail. We all want someone to think of us! Love the papers and the design - you did a fab job. Hugz. Oh, I love the colors! Love the blingy touches too. The embossing is a great touch. It might be fun to have a bedspread and drapes made out of the flowery paper. So, fun and springy. Great job as usual. Something under wraps, I wonder what that could be? That's a GREAT sketch, and I love what you did with it! The colors you used are so very, very pretty. Beautiful work on this, Colleen! My fingers are crossed for you! Your card is so pretty. I just love those spring colors. Gorgeous! I love all things embossed and that's a very pretty embossed design. 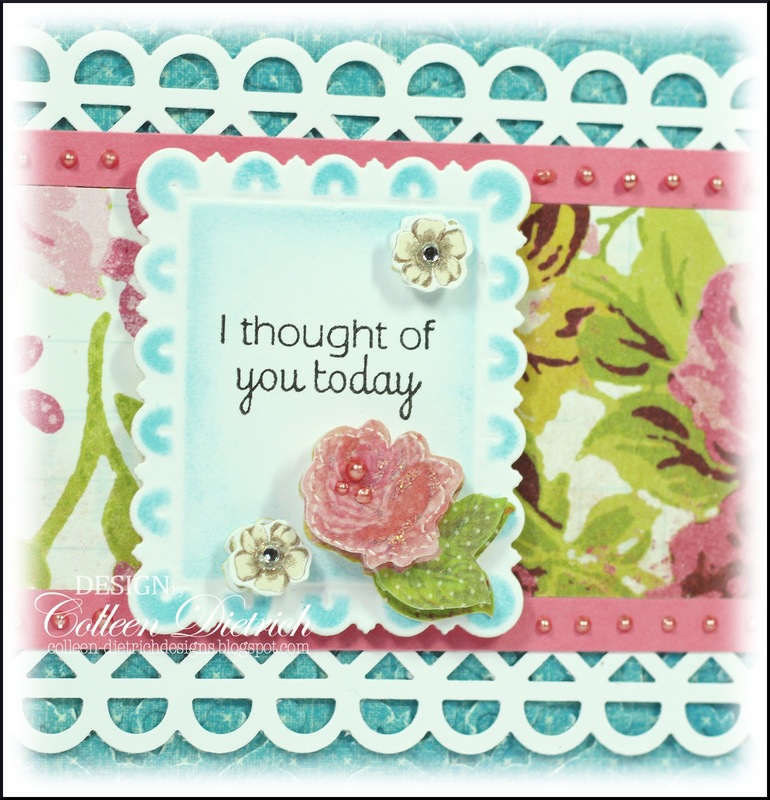 Love your colors and the paper with matching floral elements. Sweet and simple! 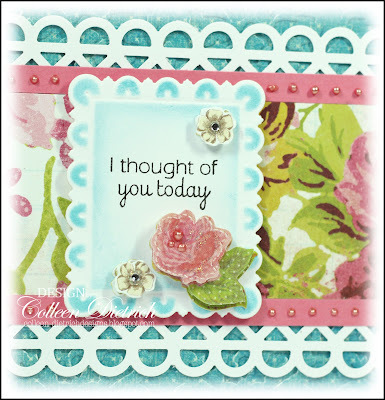 This is another pretty card with those gorgeous papers and flowers! I love the embossed blue background. I checked out your bleu hydrangea blog and love the pictures. I especially love how you find the details of a room. Another beauty Colleen! 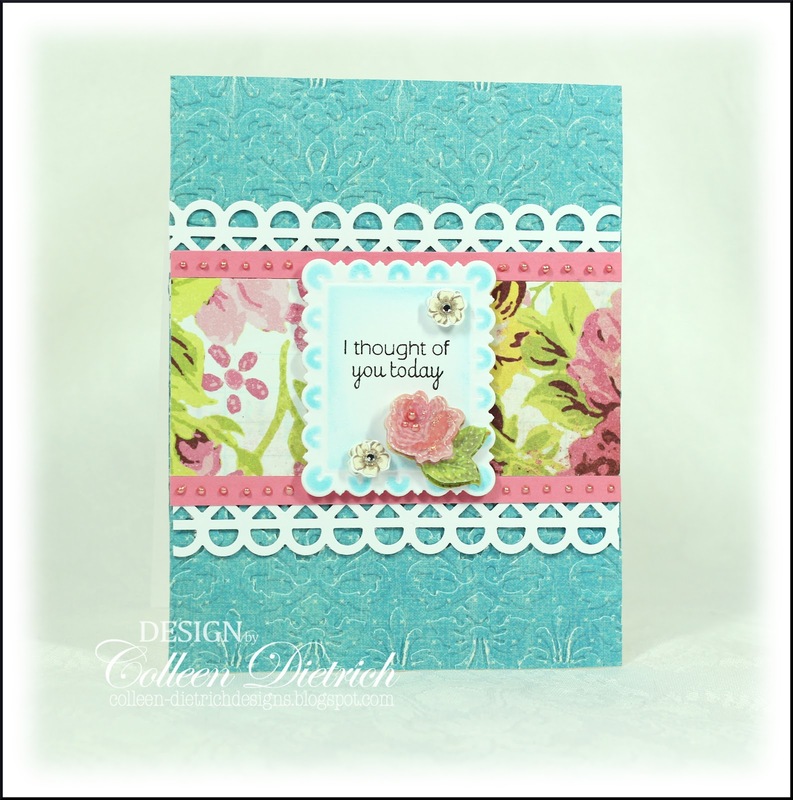 Love the embossing and that pretty teal color! 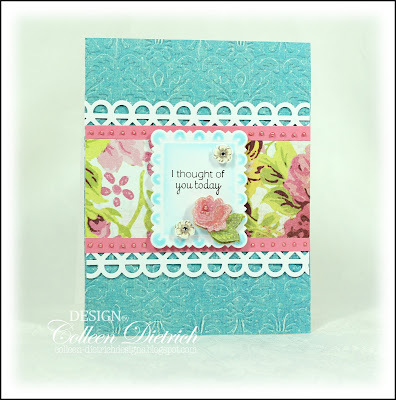 Goes perfect with that gorgeous flower paper!